The giant Chinese smartphone manufacturer, Xiaomi has confirmed the launch of its upcoming Redmi device and teased some of its features, which include a 32MP selfie camera and a large battery capacity. As per the rumours, the new addition could be an addition to the Y-series and is all set to release on 24th April in India. The price and other specifications of the smartphone have not been disclosed yet but owing to the few hints that have been provided, Redmi Y3 seems to be the device. The time of the announcement is not given but the company has also invited media, which hints that the launch event would take place sometime around 12:00 pm IST. According to the company’s Indian handled Tweet, it has flashed a slight image of the front panel of the smartphone revealing the waterdrop notch, which shows similarity to Redmi Note 7. 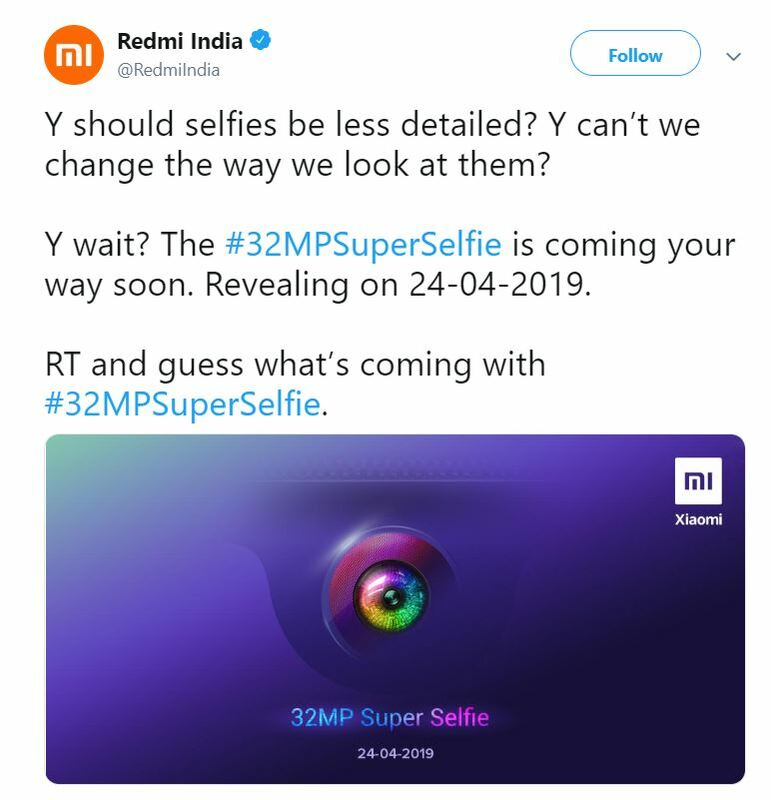 The company hashtags its post ‘#32MPSuperSelfie’, which serves further hints that it could be Redmi Y3, which has been provided with a 32MP front camera. The post clearly mentions “Y should selfie be less detailed? Y can’t we change the way we look at them?”, “Y wait? The #32MPSuperSelfie is coming your way soon. Revealing on 24-04-2019.” Considering the comments of the users, where one have guessed that the device would be Redmi Y3, the company did not show any negativity as its reply and instead, provided a finger-crossed GIF. Coming to the camera sensor, it has been rumoured that Redmi Y3 would be featuring Samsung’s 32MP ISOCELL Bright GD1 lens, which was announced last year. Considering the previous tweets from the company, it has also mentioned that the Redmi Y3 will pack a large battery capacity of 4,000mAh, which also backs up the rumours of the upcoming device as the same smartphone. The Redmi Y3 was first spotted in the Wi-Fi Alliance database and indicated that the launch is close. Not much about the specs of the device was revealed though, except that it would carry a model number M1810F6G and will be running at Android Pie based MIUI 10. Further, it will have support for Wi-Fi 802.11 b/g/n standards. However, rumours suggest that the smartphone would feature a 6-inch tall and bezel-less display having a notch on top. It is powered by an octa-core Qualcomm Snapdragon 660 chip and Adreno 512 GPU with a 3GB RAM. In terms of optics, the device would feature a dual rear setup with 12MP and 5MP lenses. It would come with a 32GB ROM. It will be fueled by a large battery capacity although it did not mention whether there will be support for a fast charging technology or not. The device would arrive with an affordable price-tag and mainly aims at the users who are looking for a camera-centric device. But there is no confirmation of the exact pricing yet. Hence, all the consumers would be required to wait for the smartphone to make its official appearance soon.